The future is dire for retail. More and more retailers are inching closer to the edge, as the list of troubled ones grows by the day. Discount footwear chain Payless ShoeSource is allegedly planning to file for bankruptcy protection under Chapter 11 as soon as next week, and plans to close 400 to 500 stores, according to a report Wednesday morning by Bloomberg. A Payless spokeswoman declined to comment. In February, it was reported that Payless would close 1,000 stores, and, in January, the company announced the elimination of 150 employees. Facing $650 million in debt, Payless, which was taken private by private equity firms Golden Gate Private Equity and Blum Capital Partners in a 2012, $2 billion buyout of parent company Collective Brands, is increasingly facing a grim outlook. Moody's Investor Services downgraded Payless' debts in early February, citing weak liquidity. Payless hired Guggenheim Partners and Kirkland and Ellis after the downgrade to initiate turnaround efforts. On Tuesday, talk began circulating that teen apparel retailer Bebe Stores (BEBE is planning to shutter all of its 181 stores and focus solely on e-commerce in an attempt to restructure out of court and avoid bankruptcy. Just last year Bebe, facing diminishing sales, eliminated 45 jobs at its Brisbane, Calif., headquarters to cut $6 million in costs. And, while this came as no shock to anyone following its situation, Sears Holding Corp. (SHLD finally admitted it is nearing insolvency. TheStreet broke the news Tuesday night that Sears indicated in its newly filed annual report that "substantial doubt exists related to the company's ability to continue as a going concern." Retail is not the business to be in right now, as e-commerce giants like Amazon (AMZN - Get Report) threaten the life of bricks-and-mortar businesses and consumers continually turn away from malls. In the words of attorney Hugh Ray, who heads the bankruptcy practice at McKool Smith, to retailers: "find a new line of business." Just in the past few weeks, Wall Street saw bankruptcy filings from sporting goods retailer Gander Mountain, RadioShack successor General Wireless Operations, everyday value price department store operator Gordmans Stores (GMAN and appliances, electronics and furniture retailer HHGregg (HGG . Last Wednesday, children's apparel retailer Gymboree cautioned that it was low on cash and may not survive. The future appears bleak for these three retailers, as well. Claire's Stores' shaky financial situation suggests no one wants to buy its shoddy accessories. The business of retailer for lower-priced girl's accessories Claire's is atrocious. The primarily mall-based retailer continues to see dwindling foot traffic, likely because it sells dinky gift shop items with few takers, and has racked up three straight years of losses. As of Oct. 29, Claire's long-term debt stood at an alarming $2.1 billion with its total liquidity at a mere $40 million. For the nine months ended Oct. 29, Claire's saw a same-store sales decline of 4.2% and its revenue fall to $928 million from $1 billion the year before, according to Securities and Exchange Commission filings. Claire's was acquired by private equity firm Apollo Group in 2007 for $3.1 billion. J.Crew Group just can't generate foot traffic. Last year, J.Crew's creditors started voicing their concerns that the women's apparel retailer would be unable to pay down its $1.5 billion in secured term debt and $350 million in senior secured debt. On Tuesday, J.Crew reported that fourth-quarter revenue fell 2% to $695 million and its comparable store sales declined an alarming 5%. For the full 2016 year, the company posted that revenue decreased 3% to $2.4 billion and its same-store sales slipped 7%. J.Crew ended the year with $132.2 million in cash. And J.Crew also revealed that so far in its 2017 first quarter, same-store sales have fallen 11%. In a recent research note, Fitch Ratings predicted that J.Crew will continue to see a decline in comparable store sales in 2017 and projected that the company will lose between $50 million and $60 million of free cash flow by the end of the year. Ascena Retail Group stock keeps plummeting. Ascena (ASNA - Get Report) , the parent company of women's apparel retailers Ann Taylor and Anny Taylor Loft and teen apparel seller Justice, among others, has seen its stock drop 67% in the past year. Early this month, Ascena reported a 2017 second-quarter loss of 7 cents a share, compared to earnings of 1 cent a share last year. Its total same-stores sales declined 5% in the second quarter, while comparable store sales fell 9% at Ann Taylor and 2% at its Loft stores during the period. The retailer ended its second quarter with $300 million in cash and a debt load of $1.6 billion. For the full year, Ascena expects its total same-store sales to decline 3% to 4%. As of Jan. 28, Ascena shuttered 55 stores, leaving its total count at 4,878 locations. 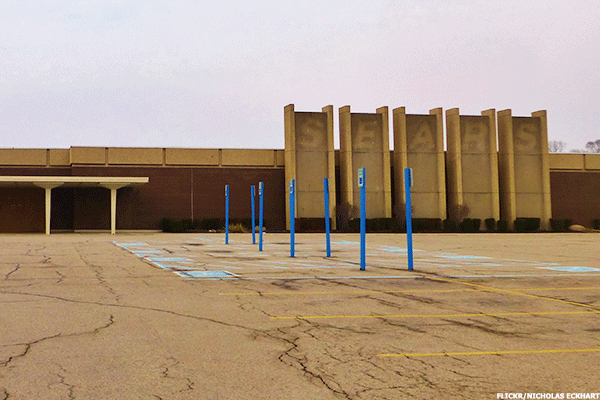 Has Target Launched a Secret Plan to Destroy Sears in One of the World's Largest Cities?